Note: this data is not seasonally adjusted. There is a very distinct seasonal pattern for imports, but not for exports. LA area ports handle about 40% of the nation’s container port traffic. Sometimes port traffic gives us an early hint of changes in the trade deficit. The following graph shows the loaded inbound and outbound traffic at the ports of Los Angeles and Long Beach in TEUs (TEUs: 20-foot equivalent units or 20-foot-long cargo container). Although containers tell us nothing about value, container traffic does give us an idea of the volume of goods being exported and imported. 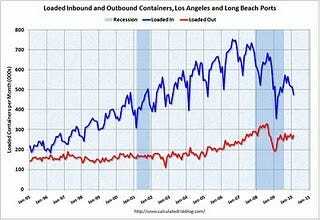 Loaded inbound traffic was up 33.8% compared to February 2009. (up 9.5% compared to last year using three month average). Of course trade collapsed in February 2009, so this is a very easy comparison. Inbound traffic was still down 18.3% vs. two years ago (Feb 2008). Loaded outbound traffic was up 32.7% from February 2009. (+33.5% using three months average) This was also an easy YoY comparison for exports, because U.S. exports fell off a cliff in near the end of 2008. Just as with imports, exports are still off from 2 years ago (off 10.0%). Trade numbers at the ports of Los Angeles and Long Beach, the nation’s busiest seaport complex, rose sharply in February compared with the same month last year, lending strength to the arguments of some experts who believe that a stronger-than-anticipated recovery may be underway. “Our feeling is that consumers are coming back. They are spending a bit more of their money. They are less concerned about losing their jobs than they have been in the last three months,” said Ben Hackett, founder of Hackett Associates, which tracks international trade at the nation’s busiest seaports for the National Retail Federation. The LA Times article is using the YoY numbers. However looking at the graph (red line), exports recovered in the first half of 2009, but export traffic has been mostly flat since last summer. The YoY increase for March will be much less than for February! It is harder to tell about imports (blue line) because of the large seasonal swings.